Riverside, CA is a wonderful city that truly reflects the city's motto "City of Arts and Innovation". Riverside is one of the fastest growing metropolitan areas in the United States. It is the county seat of Riverside County, California and is where the citrus industry in California began. As of 2013, Riverside had a population of about 315,000. Riverside is the largest city in California's "Inland Empire" region, the 14th-largest metropolitan area in the nation. The city is very large and covers more than 81 square miles. There is also a lot of unincorporated areas surrounding Riverside City. Riverside is a vibrant, growing and diverse city. It is a terrific place to live, go to school, retire, raise a family. The types of Riverside CA real estate varies from some neighborhoods that are perfect for first time buyers and then there are areas with incredible luxury homes - and you'll find everything in between. Call today to get started searching for listings of Riverside CA houses for sale. Riverside, CA is home to the Fox Performing Arts Center, the Metropolitan Museum, the California Museum of Photography, many art galleries, numerous historic sites and also plentiful nature spaces. Students flock to Riverside due to the higher education institutions in the city: University of California, Cal Baptist University, La Sierra University and Riverside City College. 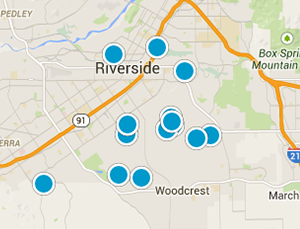 Consider Riverside CA as part of your home search. If you are thinking of buying a new home, there's good news for you. As of spring of 2015, there are a number of new home communities being built in the area - throughout many different areas of Riverside.